Hello people, its an end of another very busy year for all of us :) I am so grateful and thankful to all you people who take out the time to read my stories and make that effort to write back to me once in a while. I hope to share a lot more with you here more often. This is my last post for this year and I'll be waiting to see you in 2014 :) Have a great holiday with your families and loved ones, stay warm and drive safely! iPad mini cases were added to the shop last week. These are all well padded and lined with felt to protect and secure the iPad from damage. These are versatile and can even fit notebooks and stationery to carry around in the bag. I shall be keeping the store closed from the 29th of December (Saturday) to the 2nd of January (Thursday) for Christmas and the New Year, YAY!!!! All orders placed between this time shall be shipped on the 3rd of January (Friday). Franny and Zooey. Oh yes they look extremely well behaved here, but believe me they're soooo naughty and playful. They're teething and biting off everything they can get a hold off. They have brought so much joy in our lives and especially in Meera's. We feel truly blessed. Back from my short vacation and work is on in full swing. Made these handy card and key wallets for the shop this week. Extremely handy and useful. Perfect to use scrap or left over fabric and also that pretty fabric that I hoard like crazy :) I made one of these before we left on our trip used it to stuff some cash, our hotel swipe card keys and yes keys to the suitcase. Easily fit into my jacket pocket and since its nicely padded, it didn't fall out of the pocket while we were out bird watching :) These are just such lovely gifts and will make for great stocking stuffers. I am one of the elves for the Mumbai Secret Santa, so you could get your lovely Santees some handmade gifts from the store. Lots of Diwali wishes to all of you :) This is our little lamp that we put up outside. Hope you all didn't stress yourselves too much with the cleaning and shopping ha? I was quite cool this time. I began the sorting and cleaning a month ago, so managed to finish everything well in time. Hey lovely people...I'm sure all your busy shopping for Diwali and giving those finishing touches to your lovely homes :) Last couple of weeks I managed to do some sewing for myself other than what I put up in the shop. Sharing some of these beauties with you. You'll be surprised how much this fits in. You can actually take a peek and see..now lets do a count, so I have my two-pocket wallet in purple, my tissue pouch, there's a card keeper which you cannot make out, a small pocket pouch for all my receipts, a chap stick. I fit in my cellphone and kohl pencil in the pocket at the back. I even manage to carry a tiny jar of handcream. Phew! Thats quite a bit noh? But the pouch puffs up owing to the pleats and gives it a nice plump look. Love,love love!! The green floral lining is the favouritest part of the bag :) The moment you open the purse you get this fresh feeling, minty fresh green. These colourful cases are a pattern I picked up from Michelle Patterns. These were designed as pencil pouches but really can be used for a variety of things. Am using two of these for my portable hard drives and one to store my rotary cutter when not in use. 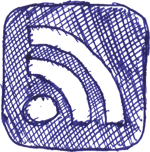 This is an excellent project to practice snap buttons. I pulled out some pretty snaps to use for these. I'm thinking of making some of these as hard drive covers for the shop, what say? I made this cute little felt basket as a hostess gift for one of the Mister's college mate's wife, who'd invited us for dinner last weekend. I filled it with tiny chocolates for their 4 year old son. This is the first time I've made something using all felt and pairing it with cotton fabric turned out to be a good idea. The matching buttons give it a nice finished look noh? This tiny phone pouch with a key ring was made as a custom order. I don't do custom orders anymore, but this is something that I'd promised someone a while ago. This is all I manged to sew apart from the stuff in the shop. I really wish I had more time to do some sewing for me. Once the shop is stocked enough, I'd love to make some dresses for myself. The fabrics are all washed and ready and have a couple of patterns I'm itching to try. 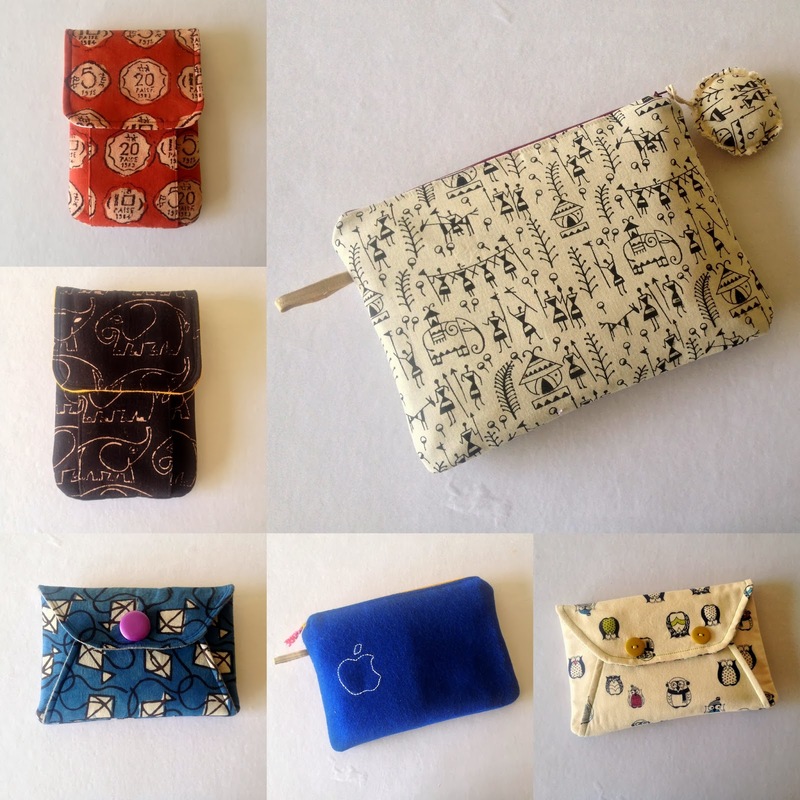 I've added a few bi-fold wallets and cellphone pouches to the shop this morning. I'm still in love with all the new fabrics I bought a couple of weeks ago and they shall keep popping in projects for sometime :) The ruffled pouches will always remain a favourite of mine and every time I make these even for a custom order or a gift, its been hard to part with them. The pattern design is so clever and unique that no matter what fabric combinations I use, they always turn out gorgeous. The Bi-fold wallets are extremely compact and useful. I was using one till a couple of months ago till I gifted it to a cousin of mine who fell in love with it :) I now use the two-pocket wallet and am really really happy with it. Shop Update - Clutch Galore! Last week I spent all my time making these lovely multi-coloured clutches of different patterns and sizes. I was really excited because I had all new fabrics to play with. I made two envelope clutches, which are my favourite clutch patterns. They so easily double up as wristlets too. The double-pocket clutches turned out really cute. I got to use my self-cover button kit which I picked up from The Pony Craft Store two weeks ago. The large pleated clutch turned out great. I didn't think I'd like a clutch this big in size. But, to my surprise its a great size to tuck under the arm and looks really nice and professional. I got to use a bit of the lovely felt too :) I'd love to make one of these for myself soon. Well, today I'm doing some cutting for my next shop update along with the Diwali cleaning. The dishwasher is running thrice a day :) Its a blessing! How's your cleaning schedule shaping up? Do drop in a line...till then ciao lovely people! Last week, I managed to make that long pending trip to the fabric market. Look at all the goodies I picked up and I might add that all this shopping happened in all of 30 minutes :) My favourite has to be the origami cat and the owl print, but the fish bone too is cute and the cycle print...okay well I seriously cannot make up my mind. You shall see alot of these prints springing up in various projects I'm working on. Oh! Yes look how beautiful the felts are...thinking Christmas anyone :)) Felts are very pricey, but I picked up a whole load which shall last me a while. The width of the fabric is huge so one meter of fabric goes a long way for me. The polkas look so yum and so I snagged as many colours as I could lay my hands on. The microphone print is something new I saw in this particular store this time. These fabrics are all available by the bolt and have no manufacturer details on the labels or the selvedges, which is sad because, the next time you go you can never get the exact same print. Well that also adds to variety right. Feast your eyes on these pretty fabrics for now and I shall catch you later in the week. I had the most satisfying time making these jewellery rolls and pouches for the shop. They come along so fast and in the end you have something that really makes life easier. Hahhaha!! No, don't get all serious here. These cutie rolls and pouches are such fun gifts and an excellent way to keep things in one place and carry around for your travels and trips. The roll has two neat big zip pockets and one ring placket which I also use for earrings and bracelets. The zip pockets are nice and deep and so you can easily fit in a few chunky kadas and bangles. I love how you can just roll these up compact and use the ties to secure them. There are tons of these available in plastic and water-proof materials, but these fabric ones just make you so happy. Don't they? 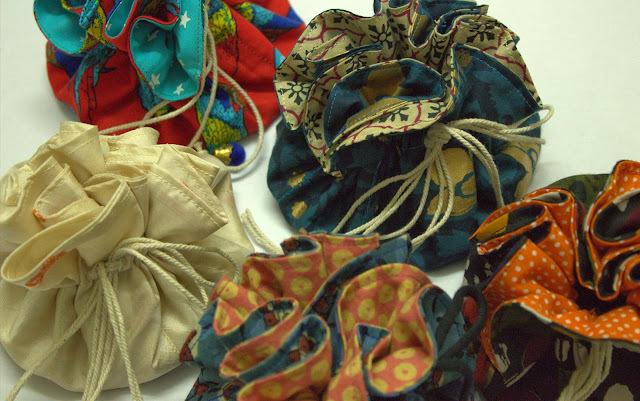 The drawstring pouches are my most favourite. I've made tons of these as gifts and they're always appreciated. The 8 pockets hold alot of my tiny earrings and studs that otherwise roll down to the base of my zip-pouches. I also carry my precious gold and silver stuff in separate pockets so that they don't rub against each other. The center is where I keep a few necklaces and bangles. I also manage to keep in a watch. The moment you pull the drawstring tight, the pouch forms a cute multicoloured bundle, which looks so lovely. The fabric needs a nice long post so that's later. Labels: haathmadebyruna.com, Jewellery organizer, jewellery roll, pouch, shop. Last month Nandini Varma, Nanu (cute as a cupcake man!) is what we call her, daughter of a very good friend and a student at ILS Law College, Pune asked me to send in my thoughts on running a start-up from home for her blog she writes at campusdiaries.com. Am a little uneasy with the term "entrepreneur" just as yet :) I did however get down to penning my thoughts a day before the deadline ended. Head over to campusdiaries.com/stories/haathmade-by-runa to read about what I have to say. Go say hi to Nanu and read some interesting write-ups she's done while in college. Card-keepers in the shop and look how cute these turned out. I've been meaning to make little gifts for Diwali and these are extremely useful. I keep a bunch of my loyalty cards in mine and because its so handy, I just put my hand in my bag and wallah! I can grab it without turning my bag topsy-turvy. Plus don't these look so pretty? My favourite bag to carry is one of my pleated purses and this card-keeper fits in so well with my wallet and tissue pouch etc. I must do a What's in my bag post tomorrow and show you just how much the purse can really fit in. You'd be surprised. I'm thinking gift-cards would be lovely to present in these cuties and ofcourse your business cards would fit in just well. Which also reminds me, I need to work on business cards for me, its about time, don't you think? Oh yehaaaa...missed out on telling you all, the Mister presented me with a dishwasher last week :)) Isn't that fabulous!!! Oh its made life so much easier. If you're still thinking about it, just go buy it. Ma has one too and its one of her favourite gadgets around the house, after the sewing machine ofcourse heeeheee. Now to going back to making dinner. Don't forget to drop in a line sometime. Bag sewing for the shop was a big learning. I did go out and try alot of new patterns that I'd been wanting to for months. The big yellow satchel turned out to take the longest and I almost quit this bag half way. I picked up this pattern from here a couple of months ago. The pattern does seem daunting at first but the instructions are excellent and there aren't too many pieces to cut. but sewing through so many layers of interfacing and heavy fabric made it pretty stressful for me. It all turned out well in the end though :) It does seem like a huge bag to carry, but its just the right size. I sure would like to make one for when I'm out travelling. The bag I'd been longing to make forever was actually the Double-zip hipster bag. This is Erin's most sought after bag pattern. It took me a whole day to cut all the pattern pieces and then another day to sew. But this has to be my favourite pattern ever. I so wanted to keep this for my self :) Its just the right size, adjustable strap, a pocket for everything, its just perfect. It sure looks very tedious and difficult to sew. However, when I got all the pattern pieces cut and labeled, that was most of the work done. I totally am waiting to sew another one just for me. The Scrunchie bag turned out to be a real surprise. Till I finished it, I had absolutely no idea how it was going to turn out. Elastic at the top and the bottom does wonders to this bag. Reminds me so much of the jholas I'd go shopping for in Janpath market when I was in college years ago. The Double-Pocket Tote is a classic pattern. Functional and so beautifully structured. I've made many as gifts and custom orders and women just love them. It was infact this pattern by Anna was my first ever pattern I bought and sewed. Diwali is round the corner and I do have alot of sewing to catch up on. So see you all later. Lunch bag sets are in the shop yay!! I had lots of requests pouring in for lunch bags after the write up in the Mint on the 31st of August. Last week was spent picking out some of my favourite fabrics from my stash and putting them together for these bags. 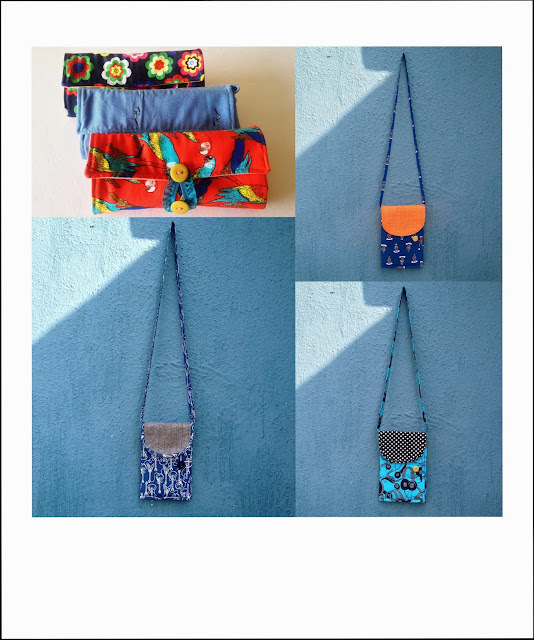 Each bag uses 5 various patterned and coloured fabrics. In the last two years, I made these as gifts for alot of people. Even Ma and Meera carry them to work, and believe me they look adorable. Gosh! all this lunch talk makes me hungry already and I've already chewed on yummy homemade chocolate cake Meera made for me last evening :)) Sunday was spent lazing at Meera's house drinking endless cups of masala chai and listening to music and ofcourse I had Jhumpa for company too. The train journey is about an hour one way and that gives me ample time to pull out my kindle. Oh the kindle has been quite a blessing, I do miss the smell of paper but aah...I just don't have the space at home anymore. Back to work I say! I'm working on a new category...so loads of planning to be done. See you later.